Ryan Goetzke's Pressure Cleaning is a professional family owned and operated business serving all residential and commercial customers. We have been servicing Boca Raton for 18 years and provide an excellent job and customer service that has permitted us to work and maintain excellent relationships in Boca's largest communities such as; Woodfield Country Club, Broken Sound, Long Lake Estates, Mission Bay, Boca Woods, The Shores, Boca Isles North and South, Starlight Cove, Boca Raton Sailing and Racquet Club and many others. We specialize in cleaning roofs, driveways, patios, screen enclosures, walls, and gutters. We are licensed and insured. 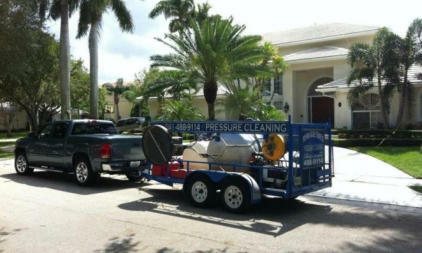 If you are interested in a free estimate please call our office at (561) 488-9114.